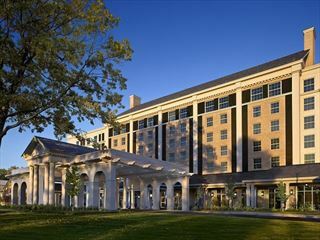 Situated in the heart of downtown Chattanooga, this stylish hotel is just a short stroll away from the Tennessee River and its riverfront attractions. With a cool coffee shop, a relaxing saltwater pool and a delicious bistro-style restaurant, you might find we won't want to venture too far from your cosy sanctuary. The rooms here are spacious and inviting, with lovely views and cosy furnishings to evoke a sense of relaxation and tranquility. After exploring the city, dip your toes into the pool before wandering along to H20 Lounge for a refreshing cocktail. Double Tree by Hilton is in the heart of Downtown Chattanooga and is just minutes away from the Tennessee Aquarium, the Creative Discovery Museum, and all of the riverfront attractions. There is so much to do here that you'll never have a dull moment exploring. Eleven, the American style Bistro, serves breakfast, lunch and dinner and is open daily from 6am-10pm. The H20 Bar is also open daily from 4pm-11pm. Room service is also available.